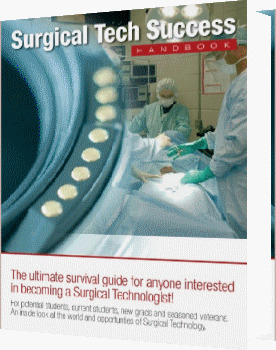 Do you really want to be a great surgical tech? Do you want to be able to walk into the O.R. with confidence knowing that any room assignment or case assignment you have that day is "no problem"? Do you want surgeons to request you on their case's? Do you want to be the "go-to" surgical tech in the O.R. when no-one else can "figure it out"? If you answered YES to any of the questions, then you are on your way to becoming that person. This newseltter is directed to the people who answered YES to most of or all of those quetions above. Listen, there are not many basic rules to master in order to be the best surgical tech in the o.r.,,, OR at least one of the best. And since I've personally been in and around the surgical world since way, way, way, way back when....I feel I can speak pretty confidently about three basic rules that I've seen help everbody in the operating room. b) Show up to work daily and practice your craft -- the more practice or experience you get, (which includes call & overtime), the better you will eventually become. ~The better you become, the more fun the job becomes, and the more fun you have, the more you look forward to going to work everyday. c) CHALLENGE yourself routinely -- Don't shy away from the more involved or difficult cases. GO FOR IT and jump into the cases you feel a weakness in. You will eventually get as good at the cases you don't know as you are with the cases you do know. So there you go, you want to be the best in the O.R., there are my three basic rules to get you started. Whatever you do, don't be --> "The engineer who couldn't". What I mean by that is not too long ago we had a person write in who had recently completed surgical tech school. Well, this person had a previous long career span in the engineering world and was looking for something different, so they decided a good career choice might be surgical technology. After 3 months of actually working in the O.R. (I believe thats what it was) this person decided it just wasn't possible to make the big bucks in the O.R. Maybe they should have waited just a bit longer to read the three basic rules for getting better in the O.R., and thier perception of & experience with the surgical world may have changed. But then again, I suppose waiting and investing a bit of time to "work the career ladder" was not a strong point of the engineer I mention. Anyway, don't be: "The engineer who couldn't". Work hard at being the best, set your sights high, and go for it. Give yourself some time to adjust and grow. It may take one year, or two years, or three,,, or how ever long it takes, if this it what your really want, DO IT! It's good to be back writing my regular newlsetters. I missed talking to you all, but have enjoyed the wonderful emails. Life is finally settling down a bit and I'm back to "rock-n-roll".